Copies of the appeal, addressed to the President of the Tamil National Alliance, the Leader of the Opposition Ranil Wickramasinghe, the General Secretary of the United Nations, Indian High Commission, Sri Lanka Monitoring Mission, International Committee of Red Cross, Human Rights Commission, Government Agent in Batticaloa and the Divisional Secretary in Vaharai were handed over to A. Nixon, a Civil Society representative, to be sent. 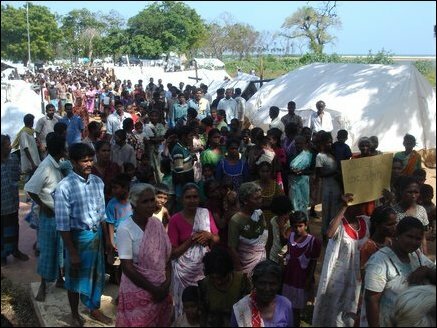 We, the permanent residents of Vaharai and the IDP from Trincomalee district, altogether comprising of 3000 families with 15.000 members, wish to bring your kind consideration the sufferings we undergo presently and expect remedy. The main access road to Vaharai, the A-15 road, remains closed for the last 2 months thus cutting the people from the rest of the country and making severe hardships to the public, should be reopened without further delay and the public transport system should be allowed to operate. The Government should allow the international relief assistance to reach Vaharai. The health facilities should be ensured to the people. Steps should be taken to ensure normal functioning of schools in this area which was disturbed very much due to the influx of refugees and military offensives in the recent past. Special examinations should be conducted to the students of this area who missed the national examinations of Grade 5 Scholarship, Grade 9 Technical and GCE Ordinery Level. The Government of Sri Lanka shuld order her Armed Forces to cease sheelling and firing artillery on populated areas in order to ensure the safety of the human lives and properties. The Government and the International Committee of the Red Cross (ICRC) should work together and declare the areas close to Vaharai Government hospital and the schools in this region as safety zones. 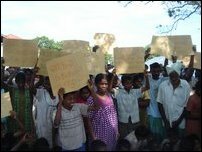 The measures to establish a coal-fired power plant in Sampoor with the hidden agenda to destroy Tamils' residences preventing the IDP of the area from resettling in their own land shuld be given up and immediate steps should be taken to resettle the IDP in a pollution free environment.